This is our 2n1 Royal Castle bounce house rental, its Pink with a royal flair. This nflatable bounce house includes a spacious bounce area, saftey entry way and basketball hoop. This bounce house Rental is uniquely designed with the square cut outs and medevial turrets that you don't see on every bounce house. This unit has a large bounce area where the kids can play, jump, bounce and hop with their friends. They also can shoot hoops with the inflatable basketball hoop that is included. 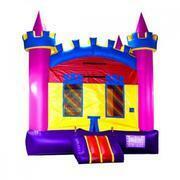 Be Sure to make your party a hit with the Girls royal castle bounce house. This unique jumper is not one to be missed. Also check out our Cotton candy and Sno cone machine rentals.